I adore curries. So much so that a quarter of girls ‘foodie’ nights I have organised have been curry nights. The best ever curry night was when my SIL taught everyone how to make their own South Indian pancakes AKA dosa. It was like having our very own Madhur Jaffrey as we gathered round the hot dosa pan swirling batter in circular motions to end up with thin crispy pancakes. You could hear the collective moans as we ate these hot out of the pan with freshly made coconut chutney running down our fingers. I, if you are reading this please, please, please come back for another session. 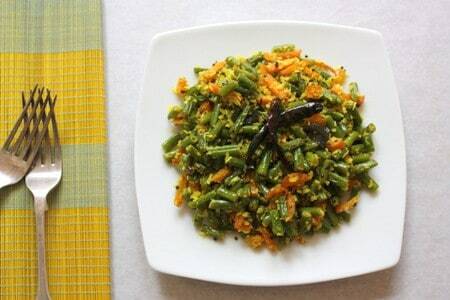 Thoran is an amazing Kerala dish – basically a dry vegetable curry (lush) made using whatever vegetable is around eg green beans, cabbage and other green leafy vegetables and is usually served with rice. 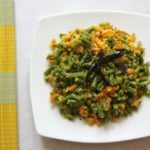 This green bean thoran is one of the recipes that can be use as a side to those curry nights or to add some umph to any meal. 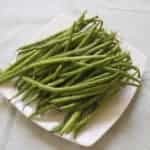 It is essentially stir fried green beans with the great flavours of Kerala i.e. grated coconut, mustard seeds, curry leaves and turmeric all thrown in. So so tasty. Adding carrots gives a great sweet contrast to the thoran so add one in when you can. And it is ready in less than 20 mins. So what better way to use up your vegetables. 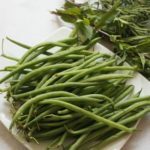 I hope you get to try out this green bean recipe which is the second in my pantry staple spotlight on green beans (french beans or string beans). Let me know what you think. So here is how to make a green bean thoran. Please do try it and if you do make it, then please do tag #recipesfromapantry on Instagram or twitter so that I can pop over and have a look. It is really, really awesome for me when you make any one of my recipes. Thank you for reading my thoran recipe post. And please come visit again as I continue dreaming up recipes, traditional African recipes, African fusion recipes, Sierra Leone recipes, travel plans and much more for you. Don't forget to tag #recipesfromapantry on Instagram or Twitter if you try Green Bean Thoran! It is really, really awesome for me when you make one of my recipes and I'd love to see it. You can also share it on my Facebook page. Please pin this recipe to Pinterest too! Thank you for reading Recipes from a Pantry. 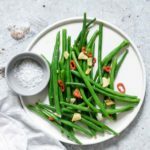 Quick and easy Indian green beans with coconut. Heat the oil in frying pan. Add in mustard seeds and cover until they begin to pop. Take care here because mustard seeds do pop right out of the pot so keep the pot covered and lift it off the fire and swirl to mix them. Then add in the cumin, urad dal , curry leaves and chillies and fry for about 2 mins. Then mix in the beans, carrots, salt, turmeric and cover and cook for about 10 mins until the vegetables are soft. Stir in the grated coconut, adjust seasoning and remove from the heat. If using unsweetened dried grated coconut just soak it in some warm water for about 30 mins, get rid f the excess water and use. Oooh this looks delicious! I love all the spices in the recipe. And your description of the thin crispy pancakes is really making my mouth water. Yum! Hi Tammy, the spices really make this dish. I love curries and will definitely love this! 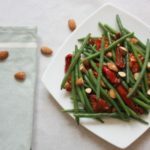 Such a creative way to use green beans Bintu! Hey Zainab, Let me know how it goes. Both Sierra Leonean and Indian cooking use coconut so lucky luck me. This thoran has some of my favourite spice combinations; mustard seeds and cumin… adding grated coconut just blows it out of the park for me. This could easily become of my favourite meals. 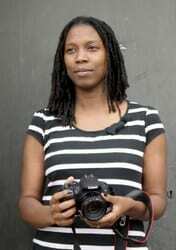 Thanks Bintu! Hey Elsa, glad I could help. We are lucky being able to have all these spices so easily to hand. Thanks Bintu for sharing this recipe. I have all the ingredients except the urad dal. Where can I get it? Does it come in small packages? I will definitely try this mouthwatering recipe. This is definitely new to me. Now I am getting hungry, lol. Hi ya, you would normally get urad dal in ethnic food shops. Do you have any around where you live? Or maybe look online?